She thought that Christian liked her, that he was finally going to ask her to his school’s homecoming dance. They’ve been talking online for weeks, so what’s with the sudden change? And where does he get off saying horrible things on her wall? Even worse – are they true? It’s been a long time since Lara’s felt this bad, this depressed, this ugly. She’s worked really hard to become pretty and happy – and make new friends after what happened in middle school. Bree used to be best friends with overweight, depressed Lara, but constantly listening to Lara’s issues got to be too much. Secretly, Bree’s glad Christian called Lara out. Lara’s not nearly as amazing as people think. But no one realized just how far Christian’s harsh comments would push Lara. Not even Bree. 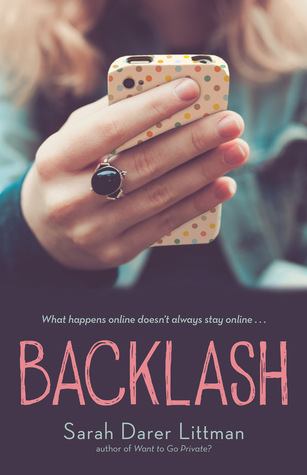 Backlash talks about bullying (both online and off). It is a common topic that everyone knows is serious but we usually only see one side of the story. We feel sorry for the person that is being bullied and despise the person that is the bully even though nowadays, the majority of us are aware of the fact that bullies are what they are do too personal issues. They are usually frustrated and angry because they don’t know how to help themselves so they decide to ruin someone else’s life to make themselves feel better. To make them feel like they aren’t alone with their issues and that someone has it worse than them. What I really like about this book, is that the characters are “humanised”. They’re not a perfect family, in fact, their thoughts and actions shows exactly how messed up humans are. The author has highlighted humans at their worst, yet we aren’t shocked by it because we know that it is the bitter truth. There is no dramatisation or over exaggeration. Obviously, you’ll sympathise with Lara, the girl that has been bullied for the majority of her life but you’ll sympathise with Sydney (Lara’s sister), who’s been living in Lara’s shadow and rarely gets loving attention from her parents. This also shows that mistakes that parents make when raising their children. It’s not just about bullying but also about mental illness, the trials of parenting and how it can affect a family. You also end up feeling sorry for the bully because at the end you will see that all kids make mistakes. The truth of it is that the bully had their own issues and didn’t know how to deal with someone else’s success when their life was going downhill. Everyone should read this book, regardless of age and gender! This book seems great! I’ll definitely be looking more into it 🙂 Really great review by the way!